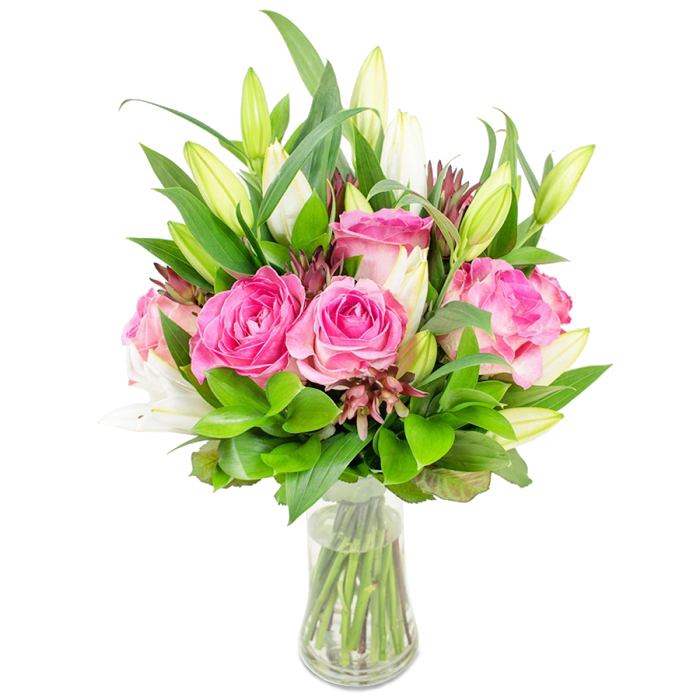 This wonderful bouquet combines two of the most elegant and sweet flowers - white lily and pink rose, creating an enchanting duo that no one can resist. The bouquet is delicately arranged with leucadendron and ruscus. The arrangement sent to my mother was simply stunning. My mother could not stop talking about how beautiful the arrangement was. Had the best online shopping experience thanks to this flower shop. The bouquet is fantastic! The flowers were delivered to my cousin in Oxford. She sent me photos of the arrangement and the flowers looked amazing! fantastic bouquet. I'm impressed with this service. Will use you again soon. Ordered it for a relative in Cornwall. They said the flowers were very fresh and pretty. My girlfriend was so happy when she called me on the phone and told me she'd received this bouquet. Thank you Handy Flowers for helping me make her so excited!